I grew up on rock n’ roll with a little disco tossed in during the 70s. Lately, my dancing has been reduced to watching it on TV and doing a little undulating to get my spanks all the way up. 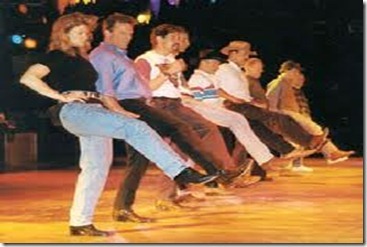 Marie and I tried our hand at some line dancing tonight, and I’ve got to admit it was fun and great exercise. We even enrolled in a class and we begin Monday to learn the finer points of kicking up our heels and boot scootin’ and stuff. We were participating in a fund raiser for the Oktibbeha County Heritage Museum billed as “Denim and Diamonds” and, as usual, the West Point natives gravitated together. At left, Frank Childs joined us, and was that Helen Calvert I saw kicking up her heels down the line? Wow, wish I had gotten a picture of her outfit. It was haute couture country. The event was well planned and well attended – 200 folks came out to eat barbeque, listen to country music, dance and support what is fast becoming one of Starkville and MSU’s bragging points. You might say we are combining the best of today to offer a peek into the past and a glimpse of tomorrow. Tall order done well. This entry was posted in Coping with retirement, Health and well-being and tagged Denim and Diamonds helps raise funds, Line Dance for Health, Line Dancing, Oktibbeha County Heritage Museum by Emily Jones. Bookmark the permalink. I joined a Senior Citizen Center a few weeks ago, and found out that they have line dancing lessons. I haven’t participated yet, but I met one little man, age 95, as he was coming out of a lesson. He looked amazing. So, I guess, if that’s what keeps us young, I might as well start now. Once again I wish I had been there. 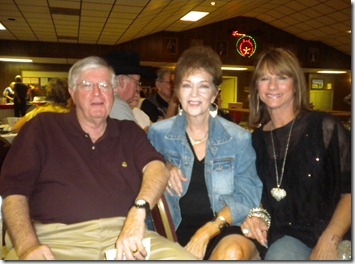 Boot scootins fun.